OK, discussion of Black Nightshade as a wild edible should only begin with a WARNING and serious words of caution. All parts of the Black Nightshade (Solanum nigrum) plant are poisonous if consumed incorrectly. Furthermore, this plant can be easily mistaken for its always-poisonous and very deadly sister plant, Deadly Nightshade. Knowing how to identify this plant and how to use it are crucial. 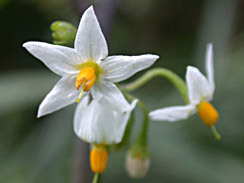 The Black Nightshade has small white flowers about 1/3″ wide, and a noticeable yellow stamen. The white petals often curl backward away from the protruding steeple-shaped stamen. The white color of the flower is one of the most important identifiers for this plant. If you’re not 100% sure a particular plant’s berries formed from WHITE flowers, do not consume them. 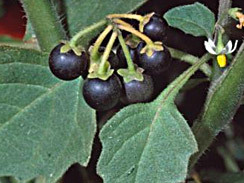 Black nightshade has dull-coated round berries, they are not shiny. When unripe, the berries are quite poisonous and green. When ripe, the berries turn black and are perfectly safe to eat, provided you are 100% certain you have the right nightshade. The berries usually grow in a cluster of several short stems originating from one point (or nearly one point) on the parent stem. The plant often grows at the edge of fields beneath partial shade, reaching 1.5′ to 4′ tall. Its leaves vary in shape and size. Just as important as knowing how to identify Black Nightshade, is knowing what to avoid in the Deadly Nightshade look-alike. Deadly Nightshade flowers look exactly like Black Nightshade flowers, except that the petals are purple. Also important, Deadly Nighshade’s berries have a shiny, glossy sheen. And the berries’ stems do not radiate out from one common point, but sprout out from the parent stem in a straight line. To recap, DEATH = purple flowers, shiny berries, and straight growth pattern of the berry clusters. Now, back to our edible variety, Black Nightshade. The berries can only be eaten safely when black and fully ripe. Hence the name, Black Nightshade. If the berries are blackish but striped with green or blackish with a green tinge, they’re not fully ripe or safe to eat. Remember, green nightshade berries = toxic. When fully ripe, the pea-sized fruits are sweet and filled with dozens of tiny seeds. The black berries (with dull coat, never shiny) can be used to make pies, salsa, salad dressing, jellies and jams, tossed in salad, or eaten raw on the trail. They taste like a sweet tomato, and are in fact a member of the same plant family. Black Nightshade leaves are poisonous unless properly prepared. Indian cuisine, for example, utilizes the young leaves and stems through a process of sequential treatment with boiling water. I personally have no experience with the culinary use of the leaves or stems, and would not engage without learning at the feet of an experienced cook. With all of the warnings out of the way, I now feel free to say: Black Nightshade is a wonderful wild edible. I’ve been treated to incredibly delicious Black Nightshade salsa prepared lovingly by a local forager. I cautiously introduced the berries into my life and body, eating one at first, then a few more. Now that I feel confident in my ability to correctly identify the plant, I feel safe eating dozens of berries in one sitting. Their sweetness is on par with wild currants, and their plethora of seeds brings subtle texture. 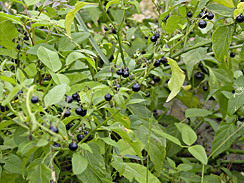 Place Black Nightshade berries in a small bowl, crush with a fork just enough to release juice and seeds. Dice garlic and onions. Heat skillet over medium flame, then add 2 tbsps olive oil and allow to heat for 60 seconds. Add garlic and onion, sautéing for 2 minutes or until translucent. Add another tbsp olive oil, allow to heat 30 seconds. Add caraway and sesame seeds, sauté 60 seconds. Reduce heat to low flame, add balsamic vinegar, pinch of salt and black pepper, then crushed Black Nightshade berries. Stir constantly until entire mixture is blended together. Remove from heat immediately. Use as salad dressing, or spread over fish. 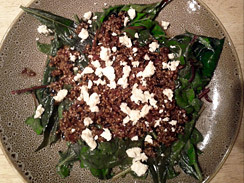 I’ve used this dressing as a garnish for sautéed wild greens topped with feta cheese. Wow.